We proudly presents our services to you which are available 7 days a week, 24 hours a day and 365 days round a year. We provide our customers with clean, comfortable and safe transportation whenever they are in a need to travel. Our staff take out time to plan your trip with you and to listen to all your concerns. We have carefully picked drivers which offer cautious driving and are familiar with the routes of Bolton as well as outside it so that you are taken to your destination on time and without any hassle. 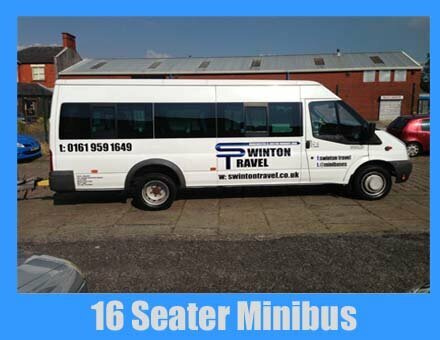 Groups of 14 or more members who are looking for transportation more open and spacious, our 16 seater would make a perfect choice. Our Ford Transits are classy, reliable and comfortable to travel in. moreover, it also provides privacy because of tinted glasses. Each and every vehicle is maintained by our skilled staff and manufacturer mechanics to give you a smooth and safe ride no matter how far the destination lies. A 12 to 14 people group who is not needing to hire a 16 seater can opt for a 14 seater minibus. These are comfortable, spacious, clean and staffed with a caliber driver just like 16 seaters. 14 seaters along with other vehicles provided can be operated as terrains and will not allow the unpredictable weather to ruin your journey. For how long you are going to rent a 14 or 16 seater will determine its price. For an estimate you can check out the quote form available on our website. You can also give a call, write an email or make a visit to our office to meet a member of staff to ensure your secure transportation. We guarantee to provide you with amazing and timely services. Minibus Hire Bolton is always willing to make people’s trips memorable with their services of providing transportation. Whether you are simply going around Bolton or you want us to drive you outside it, book our vehicles to ensure a happy, comfy and safe journey.